The proposals for the implementation of new type-approval regulations or tampering prevention of motorcycles, scooters, tricycles, on-road quads and mini-cars (L-category vehicles) has moved forward another step. The European Commission (EC) assisted by TRL (Transport Research Laboratory), has announced that it is holding a competition to develop solutions for tampering prevention measures on L-category vehicles. The competition is part of an overall anti-tampering study which aims to identify undesirable vehicle modifications that have adverse effects on the functional safety and/or the environmental performance with respect to emissions and noise of the wide range of L-category vehicles. 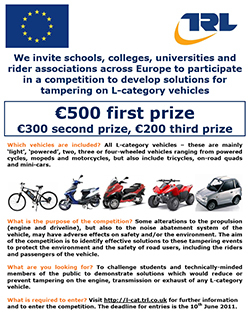 The competition is open to technically-minded members of the public, schools, colleges, universities, students and riders associations across Europe to propose innovative ideas to reduce or prevent the tampering of L-category vehicles. The competition brings with it the opportunity of winning a 500 Euro 1st prize and 300 Euros and 200 Euros 2nd and 3rd Prize. The 1st prize- the winning tampering prevention measure, will be included in European type-approval legislation. The EC states that, “It is important that when people modify their vehicles, either for customisation or repair, that they do not expose themselves or other road users to increased safety risks or allow the vehicle to emit excess pollution or noise.” Furthermore, “The aim of the competition is to identify effective solutions to these tampering events to protect the environment and the safety of road users, including the riders and passengers of the vehicle”. The EC has also stated that, “So called ‘harmless’ modifications that have no adverse effects on safety or the environment will not fall under the scope of possible anti-tampering measures. This will ensure that customizing L-category vehicles will also be possible and legal in the future.” The EC has reiterated that, “Again, only measures against “harmful tampering” will be taken on L-category vehicles – tampering which has detrimental effects on safety and/or the environment”. 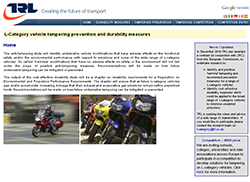 The anti tampering aspects of the TRL study is to provide recommendations and draft text for anti-tampering requirements which can be used in the regulation on vehicle construction and the identification and prioritisation of current tampering for L-category vehicles which currently apply only to mopeds and small motorcycles less than 125cc. The study will also an analysis to prioritise tampering consequences on safety and the environment, Quantification of the environmental and/or safety impacts via a physical testing programme and Identification of the measures required to prevent the identified tampering methods. Another factor is that there are balances and checks regarding illegal tampering, these include road side checks by police (which TRL mentions) but also the MoT. In the UK we have a Road Worthiness test, called the MoT. In Northern Ireland, it is an annual inspection that costs £22 (c.26 Euros) and the vast majority of motorcyclists have their bikes serviced and tested prior to taking it to the testing station to ensure that their bikes are “up to standard”. This is not just a safety issue, but also to ensure that the motorcycle is compliant to the correct standards. The TRL study does not appear to include the MoT (PTI) as a viable solution to illegal tampering. Throughout Europe there have been campaigns against the European Commission’s intentions of harmonising Road Worthiness Testing (aka Periodical Technical Inspection aka MoT). While we have reservations about any form of harmonisation from the European Commission (because of increased regulations and bureaucracy and more cost to the consumer), we have not commented yet, for the simple reason that the EC has not put forward a proposal on harmonised Road Worthiness Testing for motorcycles. Therefore we are reluctant to form an opinion until we know exactly what they are proposing. At a recent meeting in the European Parliament there was mention that young people tamper with mopeds increase performance, with the example that tampering in France is 50% in 2006 and 2007. However what was NOT mentioned was that mopeds already are subject to anti-tampering measures, so the whole discussion about this – regarding young people altering their mopeds was completely irrelevant. Clearly if this is the case (that young riders are getting around the anti-tampering measures fitted to their bikes), then the measures that already exist don’t work. According to the Commission and other organisations, it is mainly young riders who modify their bikes outside the present regulation. This means that not only are they making their bikes technically “illegal” but also they are operating their bikes outside the restrictions of their driving licence – their bike may be made greater than 125cc or the power exceeding 11kw or power to weight ratios. This is apart from the issues of safety or excess pollution which the European Commission defines as “harmful tampering”. 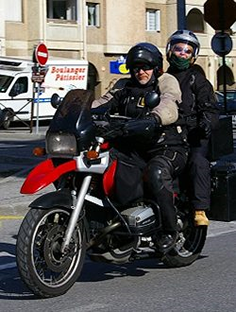 However what should not happen for riders that have a full licence for a full powered motorcycle, is that the so called “anti-tampering measures” which the Commission considers “harmful”, should impede positive modifications, repairs or servicing by these riders on their motorcycles, nor should it impede the right of riders to customise their motorcycles. The European Commission has already acknowledged that the total prevention of any undesirable modification to a vehicle can only partly be achieved by type approval legislation requirements, and that it is just a matter of time when revised countermeasures will again be circumvented. If the recommendations and draft text for anti-tampering requirements impedes positive modifications or if the submissions by applicants to the TRL competition suggest restrictive measures beyond those already applied in law for mopeds and motorcycles up to 125cc, we at Right To Ride, could not accept or support any outcome that would imply or define further restrictions. We will continue to reiterate our position that existing controls through type approval and enforcement (road side checks and MoT) are sufficient to ensure that illegal tampering is stopped or at least minimised. The TRL study will also identify the tests and/or measures that would be most effective for ensuring L-category vehicles are sufficiently durable so as to maintain acceptable exhaust and evaporative gas emissions as they age and through use. This performance criteria is intended to be included as a chapter on durability requirements in a delegated act. This will form part of a European Regulation on Environmental and Propulsion Performance Requirements. The overall objective of the TRL study is to recommend cost-effective measures for durability requirements including, among others, an appropriate durability test cycle, an acceptable correlation method between rapid ageing of parts and actual mileage accumulation. Consideration will be given to the repeatability, reproducibility and accuracy of any proposed measures and an appropriate benefit to cost ratio. In other words or in simpler terms, when a motorcycle is purchased it has already passed emissions checks before leaving the factory. Those emission levels must thus remain acceptable during use. Therefore the manufacturers are responsible for emissions remaining within acceptable levels, However, this level of acceptability is being studied which includes how this will be maintained, i.e. by testing. Who will pay? And at what stage in a vehicle’s mileage the rider must test or pay for any upkeep of the emission levels. TRL is seeking the views and advice of a wide range of stakeholders. If you have not been supplied with a password, please email L-category@trl.co.uk to request one. Many thanks indeed for this well thought through and useful article on what is becoming a very difficult debate. I think this is the creation of a “problem” where simply none exists. Moped modification is well known in Southern Europe where mopeds are used in vast numbers and owners are simply not tolerating the speed restriction. There is no evidence at all of widespread dangerous vehicle “tampering” amongst motorcyclists. TRL was asked to investigate and has so far not done so. Therefore this new competition seems to say the least premature. 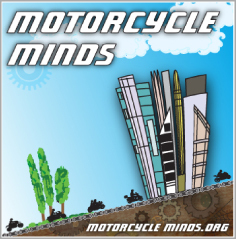 Thank you very much for the work you do for motorcycling, – your research is really helpful!